This section contains resources to help promote a healthier diet and lifestyle, including specific advice on vitamins and minerals, fibre, osteoporsis, arthritis and activity. Information giving practical ways of making traditional South Asian dishes more healthy. Healthy options for eating out and takeaways. A guide to healthy eating. Good sources of calcium in the diet and how to ensure you are getting enough. This leaflet gives some ideas for putting healthy eating advice into practice by choosing quick and easy meals. This booklet contains information to ensure a balanced healthy diet if you wish to follow a vegan way of eating. Food and meal ideas for a vegetarian diet. This booklet contains information to help you follow a vegetarian way of eating. Good sources of vitamin B12 in the diet. Good sources of folic acid in the diet. An NHS leaflet on good sources of vitamin D in the diet. A leaflet for patients who have attended an NHS health check - containing a brief guide to first line dietary and lifestyle advice, and signposting for further information. The Food Standards Agency offer lots of practical advice and information on healthy diet and lifestyle at their Eatwell website. The NHS Livewell Website has activities, information and resources for a healthy and Active Lifestyle, for children, teenagers and adults. The Eatwell Guide shows the different types of food we need to eat - and in what proportions - to have a well balanced and healthy diet. 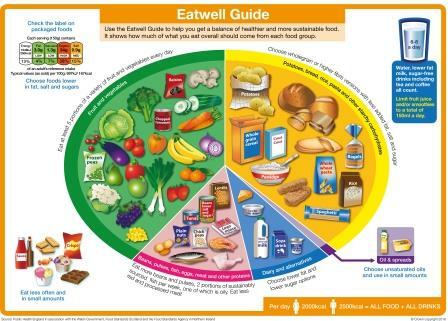 Click here to download a guide to the Public Health England Eatwell Guide. It's a good idea to try to get this balance right every day, but you don't need to do it at every meal. And you might find it easier to get the balance right over a longer period, say a week. When should I use the eatwell Guide? You can use the eatwell guide to help you make healthier choices whenever you're: at home deciding what to eat, what to cook or what to shop for out shopping - aim to fill your trolley with a healthy balance of different types of food eating out in a restaurant, café or work canteen, or when you're choosing food ‘on the run' - follow the eatwell guide to help you choose a healthy balance. on healthy eating through life, from babies, to teenagers, adults, post menopausal and later life.